The 2018 Hempell Sailing World Championship begins for the 49er and 49erFX on Saturday the 4th of August and the Nacra 17 racing begins the following day. Each day there are live broadcasts from the Stadium course and we will send you the live notifications daily for easy access. 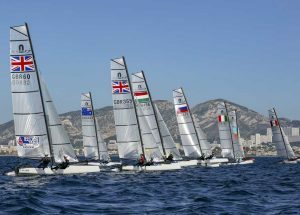 There is more than medals at stake as these Sailing World Championships are the first and largest qualification regatta for the 2020 Olympic Games in Tokyo and Enoshima (sailing), with 40% of the places being decided, 8 nations for Nacra 17. Iker Martinez, the 2004 49er Gold Medalist, and crew Olga Maslivets, 4th in RSX from London, have dug themselves into a huge hole to begin the 2018 World Championship. During inspection, the IM team spotted a modification to the top port bearing. After a night of quarantine, checking against the design and the bearings that the rest of the fleet have, it was deemed 5mm shorter than the rest of the fleets and a protest was lodged. The jury assigned a DSQ for the infringement and then upped it to a DNE (do not exclude) because it was an intentional modification. 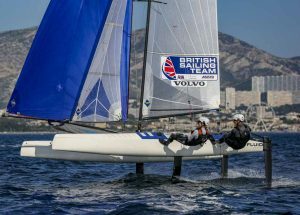 The top bearings on the Nacra 17 can be moved while sailing, and are frequently adjusted by the teams to control the angle of the daggerboards. 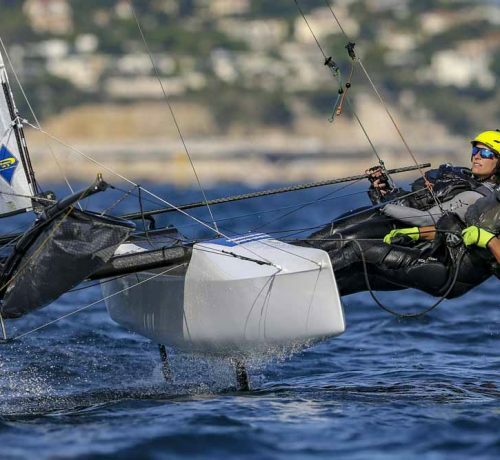 By making their bearing shorter, the Spanish were aiming to enable a greater maximum pitch, which can help promote foiling earlier than the standard design. 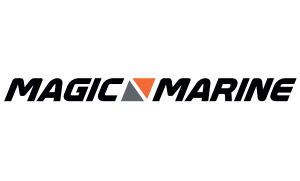 This could be used to get into a foiling mode sooner upwind, or up on the foils sooner downwind. By modifying the port bearing, this advantage would be available off the start line and around the windward mark, two critical areas of the race course. Iker and Olga are in possession of 1 of 3 test bearings, which are 20mm shorter than the current equipment, which are being used to check the effect of increased daggerboard rake. They were asked to test it outside of competition ahead of a possible future introduction as a specification change. UPDATE 4/8/2018- Iker and Olga have packed up their boat and gone home, retiring from the regatta! After the decision the duo packed up their boat overnight and had left the regatta site by morning. 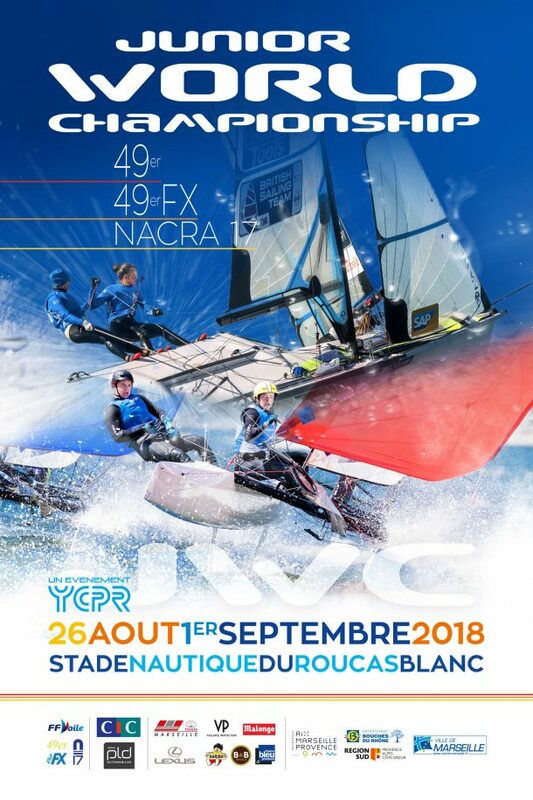 Racing begins for the Nacra 17 on August 5th and concludes on August 12th.